Busy Ship day, originally uploaded by captainjay. Yesterday was a very busy ship day. 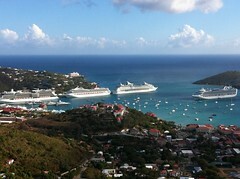 There were four ships in the harbor (three on the dock and one anchored) plus two in Crown Bay. Traffic was a little crazy on the way home but I'm sure it was a lot crazy earlier in the day. Mondays don't usually have that many ships in. Normally Tuesdays and Wednesdays are the busy days but today there is only one ship in. So I guess they're moving things around a little. But either way it looks like the St. Thomas cruise ship industry is still going strong.